1 - Peel the kiwi fruit and chop it into small chunks. You don't want the skin because it's mostly dead and doesn't have much DNA in it. 2 - Put the chunks in a jar and mash the kiwi as much as you can. This is to break up some of the cells and provide a large surface area over which to extract the DNA. 3 - Mix together the washing up liquid, the salt and the tap water and stir slowly until the salt has dissolved. Don't stir too fast or else you'll get lots of bubbles! This mixture is also known as an extraction buffer. The washing up liquid is a detergent and this breaks open the cell membranes and nuclear membranes. Once these membranes are broken, the DNA stored in the cells can escape. The dissolved salt (or sodium chloride) is made up of positively charged sodium ions and negatively charged chloride ions. DNA is also negatively charged and attracts the positively charged sodium ions. This neutralises the charge on the DNA, which allows the strands of DNA to stick together and form the clumps we will see later inthe experiment. 4 - Add the extraction buffer to the mashed up kiwi and MASH! The more you mash, the more DNA you will get out at the end. 5 - Incubate the kiwi and buffer mixture at 60 degrees Centigrade for 15 minutes. To make your own incubator, take a large basin and half fill it with boiling water from a kettle. To reduce the temperature, add about the same amount again of normal tap water. Using a thermometer will help you reach a more precise temperature. Carefully put the jar with the kiwi into the incubator and leave to stand for 15 minutes. Incubation helps to break up the cells further and starts to degrade some of the cell's proteins. 6 - Remove the jar from the incubator and filter the kiwi mixture through a fine sieve or coffee filter paper into another jar. This removes all the unwanted lumps and bits of kiwi fruit. You should be left with a green liquid, and this contains the kiwi fruit DNA. 7 - Take the ice cold alcohol and pour it slowly down the side of the jar. 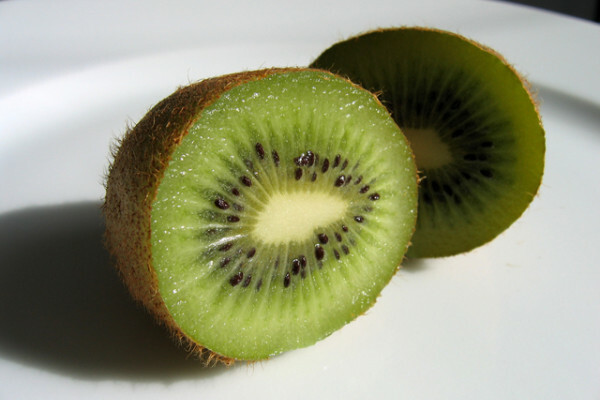 The alcohol will form a transparent layer on top of the kiwi mixture, as the alcohol is less dense. You can use a paper clip or some tweezers to pick up the DNA. It will be long and stringy and clump together. DNA is a very long molecule and when it clumps together, it forms something a bit like a rope. This is safe to play with a poke at. The DNA you have extracted has come from billions of kiwi fruit cells, which is why you can see it so easily. If you were able to unravel the DNA in just one human cell and stretch it out, it would be two metres long. However as DNA is so thin, you would not be able to see it without an incredibly powerful microscope. Is dementia in your genes? THE PROCEDURE BRINGS LIFE AND MOTIVATION TO SCIENTIFIC INQUIRY - THANKS.